In "Miracle" (2004), recounting the true story of the United States Olympic hockey team’s improbable defeat of the unbeatable Soviet Union, there is an early scene when coach Herb Brooks (Kurt Russell) is seated at a conference table with a bunch of stodgy know-it-alls pitching old fashioned, lamebrain ideas to topple the hammer and sickle before Brooks calls them on the carpet, explains their ideas won’t work and that his ideas will. 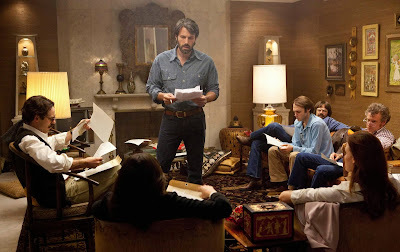 In "Argo", recounting the true story of the clandestine operation to rescue six trapped Americans during the Iran Hostage Crisis, there is an early scene when CIA operative Tony Mendez (Ben Affleck) is seated at a conference table with a bunch of stodgy know-it-alls pitching old fashioned, lamebrain ideas to rescue the six hostages before Mendez calls them on the carpet, explains their ideas won’t work and that his ideas will. That was the moment it hit me – "Argo" is structured like a sports movie. Now I do not mean to suggest that a hockey game – however important and unforgettable it was within its own context – is as critical as the Iran Hostage Crisis and real life lives on the line. But we are discussing the making of a movie, and in movie terminology the framework of "Argo" eerily parallels a sports movie, right down to the barely seen spouse and child on the home front. And this is, in fact, mostlya good thing. Mendez, dourly played by Affleck in such as way as to almost resist the stereotypical heroism of the role, is summoned to CIA headquarters by his superior (Bryan Cranston, quietly hilarious) after the crackerjack opening in which Affleck, as director, swiftly, flawlessly re-stages the Iranians storming the American embassy in November 1979 and the six Americans who make it out and into the street before taking shelter, unbeknownst even to most Americans at the time, at the Canadian Ambassador’s home, played here by Victor Garber who effortlessly conveys noble humanity in minor screen time. 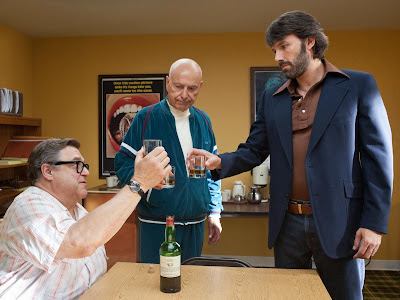 Once Mendez calls out the stodgy know-it-alls he goes about formulating his own rescue mission – that is, a fake Hollywood movie production, a space opera called "Argo", put into mostly real production by crusty, foul-mouthed producer Lester Siegel (Alan Arkin) and makeup man John Chambers (John Goodman). Mendez will pose as “the money”, a Canadian producer flying into Tehran with six other Canadian crew-members to scout locations. Then he will gather up the six hostages posing as his six crew-members, walk into the Iranian airport with them and fly right on out. It is equal parts bold and ridiculous. “It’s the best bad idea we have, sir. By far,” says Cranston. You know the rest of the story, right down to the very end, and yet, to their immense credit, Affleck and his screenwriter Chris Terrio manage to still render a riveting drama. They do this partly by elucidating mounds of complex information in a crisp manner. They do this partly by not only playing up the inflammatory political climate of the time but by painting it as something universal, such as in a masterful montage (of which, thankfully, there are but a precious few) where they contrast the table reading of "Argo" with bad actors (Adrienne Barbeau?) in absurd costumes with Iranian revolutionaries listing demands. They do this partly by wringing every single conceivable drop of drama from the already dramatic proceedings, cramming so many Near Misses – you know, the rescue is a split second away from crumbling, falling apart, going up in smoke…until IT ISN’T!!! – into the third act that, quite frankly, it nearly becomes comedic. And you walk away with a smile on your face, maybe even a tear in your eye, supremely satisfied, highly entertained, yearning to applaud, which is due in no small part to the fact that "Argo" is brilliantly crafted to elicit the same sort of reaction one might have had in the waning moments of the U.S./Soviet hockey game when we all realized that, yes, we do believe in miracles. Writing for NPR in 2006, longtime sportswriter Frank Deford went about creating his own sports movie with a “one-size-fits-all sports movie script.” See if his four act structure sounds familiar. Act I: The Introduction Of Hopelessness. Act II: Hope Arrives In A Surprise Package. Act III: Unusual Strategy. Act IV: The Climactic Contest. I suspect so many of us are worn out with sports movies because of their well worn formula, but "Argo" takes the formula and injects it with different details and a political allegory. It is Hollywood at its finest. Borrow and tweak. Lester Siegel would be proud.